Ahoy, matey! There's nothing like the open seas (or lake...or pool for that matter) on a summer's day. This week at the Daily Fast Fuel we are setting sail. 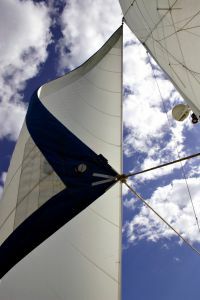 Sails in the wind are a beautiful picture of the power that can come from the unseen. And sometimes we need to cast our faith up and see where the Spirit might lead. This week, we share some places in our life that we are currently hoisting our sails, and the lessons we are learning in trusting God in the process.